Adidas has created something unique with their new F50 adizero range. If you had a chance to read the Synthetic review last week, you will be familiar with the fact that these are the lightest soccer cleats on the market. But there are several rather large differences between the Synthetic and Leather version that will leave you with a decision to make about which one is more suitable for you. Luckily, I had the opportunity to interchange between both versions while testing, allowing the best opportunity to feel what differences that exist in performance. I have used the Leather versions in 3 games and multiple trainings over the past few weeks testing a size 9US in the Chameleon Purple/White/Electricity version. Does the adizero actually feel lighter? Without having to think about it the answer is “YES.” When I took these out of the box for the first time they blew my mind! It is absolutely astounding how light these feel. I have to admit that I am normally skeptical of lightweight boots, and have stated that I never really notice a difference in terms of weight, but the adizero completely changed my opinion. They are light in your hands and light on your feet! The leather version was a lot easier to break in than I anticipated. As with the Synthetic version, I used the comfort insert for the first few wears instead of the ultralight version. This helps a lot, and you can feel the extra comfort you get from the thicker insole. Because these have a leather front, they do take time to really mold to your front. From day 1 they have a tighter, more snug fit than the synthetic version, which is designed to be a little bigger. It takes plenty of dribbling and crossing to help them mold to your feet. Comfort wise, I have to admit that the heel bothered me a little more than it did in the synthetic version. Again this is due to the fact that the leather version fit a little more snug. But overall, I preferred how these fit and it didn’t take long until I had them moving in unison with my feet! My advice it to wear these in one or two trainings before putting them into action on the field! A lot of you have been asking how much of the boot is actually leather. Adidas use a full grain Galeo cow leather upper that is soft, but not quiet the quality of K-leather. You can tell where it starts by looking for the first line of stitching on either side of the boot. To be more specific, on the left boot it runs from the top lace on the inside of the cleat to the third lace on the outside of the cleat. I would say approximately 50% of the upper is leather, focused on the front of the boot, where you are going to need it most. Adidas also use stitching that runs right across the leather to create a pocketed cushioning. This aids in giving a controlled feel on the ball. In terms of size, you are going to want to order true to size with the leather version. I have stated a few times that there is a little more space in the synthetic version, which accompanies many comments about the F50 adizero running a half size to big. But the leather version has a snug fit that you will need to work with to really mold to your foot. I am a huge fan of how Adidas has designed the Leather version. 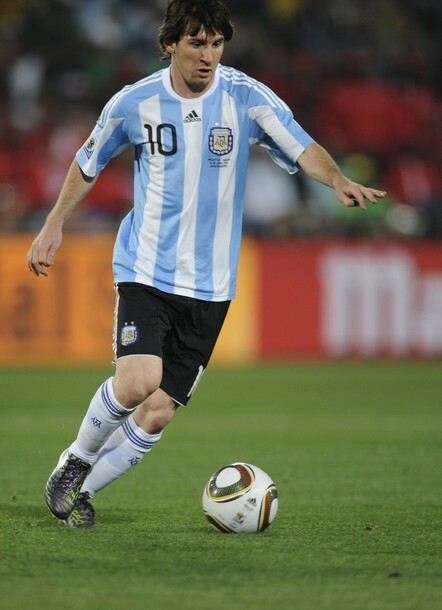 The Chameleon version, as worn by Lionel Messi, has an extremely unique look that really can’t be explained in a post. You have to actually see them to understand the color patterns. The bright yellow (electricity) color that Adidas use in the detailing compliments the full look of the boot. One area that it is particularly evident is in the stitching used around the lip of the boot, about an inch above where the upper and soleplate meet. Adidas also use their signature 3 stripe logo in white on the outside of the boot to create a classic look. Flip the boot over, and you will find one of the most minimal soles ever! On the Chameleon version, the sole is entirely white except for the yellow tipped studs that makes them pop when you see them from behind. One of the more unique aspects of the cleat lies on the heal, where Adidas have replaced the regular wide grooved heel with a much smaller, yet extremely comfortable, thumb heel design. By thumb heel design I mean it literally is a thumb width in size and it extends slightly higher on your heel than it normally would. I like this part of the design as it gives that extra bit of material to keep the boot close to your foot, without adding any extra pressure in the region. Again, as with the synthetic version I have to admit that it is difficult to come up with any negatives for these. For once I am stumped! Adidas have created a very elegant looking, superlight boot that somehow manages to maintain comfort. Enough said! Hey bryan, Great review. I have both the synthetic and leather F50 adizero, and I also prefer the leather version. Check out my youtube channel for videos of both the synthetic and leather versions. Checked out your channel, some nice vids, good job with them! That is a good question. The leather version does have more padding, especially in the areas between the stitching. In saying that, I am not sure it offers that much more protection than the synthetic but there is definitely more material there. I think it might be more to do with personal preference, and more players liking the quality of a leather vs synthetic boot more than anything for the pro's. I'm just wondering if the studs on these shoes are fragile because I've heard that there is nothing inside the stud (what i mean is its just like a shell) and I've seen a picture of a broken f50adi stud. Another thing I've heard is that these are more of a "match shoes" because the leather is not very durable, is that the case? Hey Bryan, once again a fabulous job. I know you described the synthetic version’s sprintskin to be as thin as a few sheets of paper, but what do yo make of the leather? More protection? Most adizero-wearing pros have been opting for leather, and i have been wondering if perhaps the added protection is the reason. Thanks in advance! I have the leather version & so far they have been really hard to break in for me. I've tried the "shower" technique & have used them a few times in training. Not sure if I should continue sticking with them or just move on. some cleats just aren't right for your feet. Awesome review. Looks like the cleats are unexpectedly comfortable! Usually, I'd think that speed cleats are less comfortable and less durable and such, but they do seem quite comfy to me. I wonder how they managed to produce such light cleats that provides comfort and speed at the same time. 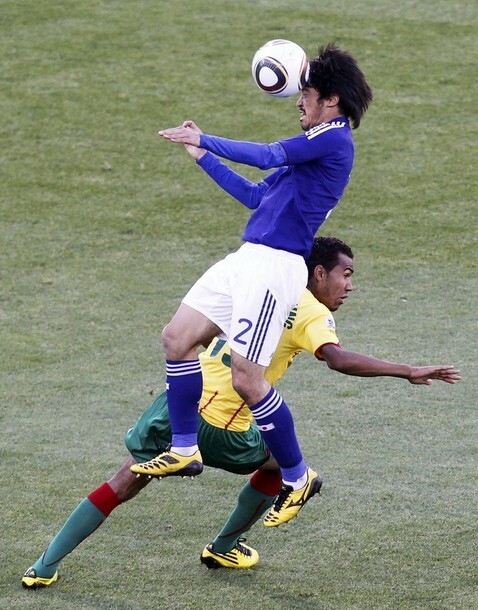 By the way, were you watching the Japan vs. Cameroon game? Just before the game, the camera was zooming on a Japanese player's (I think number 2 but I'm not sure) cleats. They were yellow with few black ellipse shaped patterns on them. I've never seen those cleats before yet they were quite fancy. Perhaps the camera man thought so as well because he was focusing on those cleats for awhile. Do you have any idea what cleats would those be? Thanks for responding. The cleat feels perfect everywhere except for the toe area. I received a nasty blood blister underneath my left big toenail. Don't know if it was from the cleats or possibly being stepped on. Sonny: Those are the Mizuno WaveIgnitus that Yuki Abe, and the goalscorer, Keisuke Honda wear. Where have you seen pics of the studs falling off? I haven’t experienced this and I feel it is unlikely to happen unless you are wearing them on extremely hard surfaces. Sometimes a boot just won’t suit! Where are you experiencing problems? Toe or heel area? My theory is that considering this leather cleat is lightweight, the leather upper must be thinner than a leather upper from a traditional cleat, and therefore, this feature would not be as beneficial in terms of strength in kicks. I am currently a high school student, feeling skeptical about how the thinness of this leather cleat may affect my shots, debating whether to purchase cleats with a thinner upper (AdiZero F50 Leather) or cleats with thicker uppers (for example, the AdiPures). I may be over-thinking this, but hopefully what I'm asking makes sense. Thanks in advance. Thanks for the responses, Bryan and Maurice. I'm going to look up those cleats and what they offer besides the unique look. @Sonny: Try http://www.soccerbible.com for the mizunos. they have all the info AND a play test! personally one of my favorite cleats. Are you keeping the chameleon colorway? I thought you were a more classy-colour player! I guess you really liked them! they are really comfortable, you should consider them! Ive seen a broken stud in a chinese forum and I cant find the post anymore. Do you reccommend these if i play on 3g astro turf (the ones with a lot of black rubbers on the artificial grass)? so..are these are more of a “match shoes” because the leather is not very durable? Hey Bryan, thanks for the review(s). Been eyeing the Adizero's for a while, and trying to decide whether to go for leather or synthetic. I've definitely noticed that almost all the pros have gone leather, and was curious about this as I thought most of the "innovation" on this shoe was with the new synthetic skin. Anyway, I was curious as to why, as their high-end shoe, Adidas decided to come out with this in cow leather. Have you noticed a big difference between this and the K-leather, and do you know if there's plans for the shoe to come out in 'roo later? My suggestion would be to go strike the ball hard with your instep without wearing your shoe. If that bothers you, don’t get the adizeros. I’ve been wearing the synthetics for about a month now (material even thinner than the leathers) and it feels just like striking it bear foot to me. Personally I like the feeling, but it might bother some other people. Test out your power bear footed and that will probably be close to what you’ll get with these. I’ve been wearing the synthetic firm grounds on those artificial turf fields with the little black rubber things and not had a problem. The studs seem very solid and unlikely to break. hey bryan, I want to know if the comfort and touch of this shoe are better than the synthetic version or the previews versions of the Adidas f50i. Also, are the f30 adizeros more comfortable than the f50s? I will see what I can do about getting the CTR360 Elites to review! Unfortunately, I really can't offer advice on the leathers as I am not familiar with the Galeo cow leather. I have applied leather food to the ones I have and it worked fine. I will try researching the leather a little more and get back to you on it! AFAIK, cow leather is far cheaper than k-leather but still provides the comfort k-leather offers, not exactly the same, but similar I might say. Furthermore, k-leather is expensive and what adidas tried is to sell is cheap, light boots. If they use k-leather than the sale price would’ve gone up otherwise they will incur loss. We I just got both synthetic and leather versions of this boot. I have to disagree for the sizing. The synthetics definitely run half a size large (at the very least, if you’re a small 9 you may be an 8, but most probably an 8.5). The leathers depends more on what kind of a size 9 you are. If you’re a 9.25 then you maybe a 9, but if you’re an 8.75 that usually wears 9, you are probably an 8.5. Which is basically me and that’s my conclusion. Does anyone know if adidas is going to poduce the yellow leather ones, like the pros are wearing, for the regular public in the US? hey bryan, i was wondering if you know when the cyan/white/radiant pink f50 adizeros come out!? wow nice review! please do u know of any new colors to be released soon? I had the same problem with blisters on the ends of my toes from wearing the synthetic versions. It got significantly better after about 3 games and several training sessions so I would stick with them. I play defensive center mid and get stuck into lots of tackles and challenge a lot of balls pretty hard. So far after about 3 games the synthetics seem to be very durable but offer significantly less protection than any leather shoes I've worn. I assume the leather versions are similar. But it doesn't bother me much since I've been playing for so long I'm so used to getting hacked, doing it in bare feet with no shin guards wouldn't bother me either. Go with the adizeros if you can take the pain. I've noticed a bunch of defenders using them in the world cup. First of all i want to say great job Bryan on the reviews!! I have several question for you and the people out there. 1. what would you recommend for ME(Im a striker/mid), Nike superfly 2 or the Adidas adizero F50? 2.Out of the Adidas adizero and the nike superfly 2 reviews you have done. Witch boot did you feel more comfortable,lighter, and with greater striking force while you were reviewing them? 3.What are some pro's and con's between the superfly 2 and the adizero F50? 4. What are the purposes of the Carbon Fiber in the Nike superfly 2? when you reviewed them did you feel any extra power when you kicked the ball? were you able to curve the ball pretty well? great review! Have a question though. Does the synthetic have greater traxion on the synthetic because of the new "grain" material or does the leather? I had the option of purchasing the synthetic one or the leather one that was only available in the chameleon colour. I have flat feet and thought that the leather one had more give and would be more comfortable over time. The shoe is great, looks good and is very light. I did get a blister on the back of my heel during the first few games, the shoe I got fits snugly but the shoe has a component in the heal that comes up hight and might've caused the blister. Overall, awesome shoe. My previous shoes were Predators, that were great shoes but I realized way too late that they were too oversized and as a result I got a full size smaller with the F50s and it make a HUGE difference to ball control and shot accuracy. I picked these up this week and wore them for a pickup game that ended up going about 2 hours. My right foot came through mostly unscathed (some minor rubbing), but my left foot developed some nasty blisters on the heel and big toe. That is my fault for wearing them in such a long session on the first wear. I think they definitely require some break-in time. 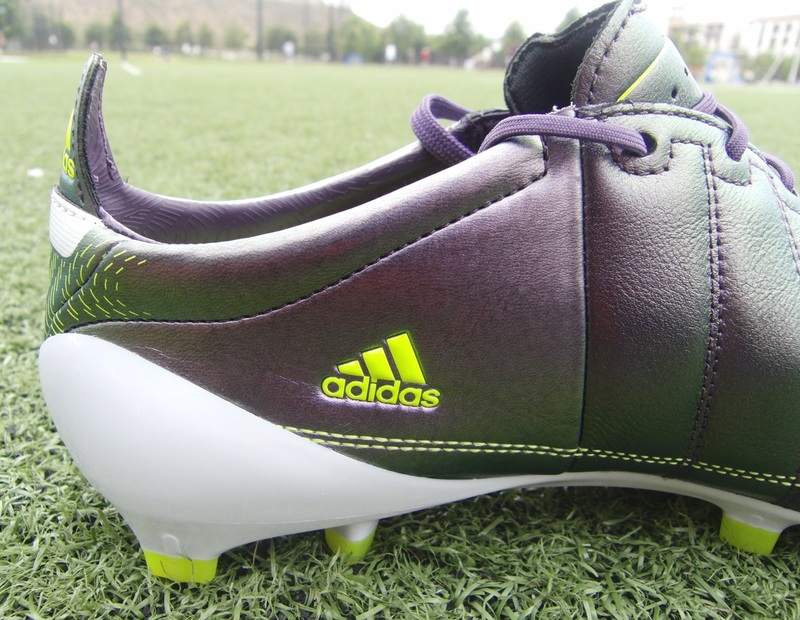 My old boots were especially heavy, and I was stunned by how the F50s feel when you accelerate. I'm not sure if the boost in agility is mental or real, but I have never experienced anything like it. Once they are broken in, I'm sure they will be my new favorite boots. The main thing I worry about is the durability of this thinner leather. A couple of my leather cleats have split where the upper is attached to the sole, where as i haven't yet seen this problem with my synthetic cleats. I play winger in high school and I'm looking for a pair of cleats that won't split on me and will last me all season. I was wondering if these will do that job for me. i saw this at some forum… will the studs really break off after playing at AF?? Some people raised the durability issue, but I don't think it's been answered definitively. What's the difference between the leather and synthetic versions in terms of durability? Well I've had these for maybe 2 weeks now and they are really good so far! Definitely run true to size, opposed to the synthetics which do run long. Like Bryan, I had some discomfort in the heels (small blisters) the first couple wears, but now they're comfortable! I used these in practice, and some solo training to help break them in. The comfort insole helps alot too. Oh yeah, they're crazy light! Ps. Bryan thanks for all the helpful reviews! Some who have used the leather version on astro turf. Hi, great review. Could you please confirm whether these fit wide or slim? I'm after a lightweight cleat, but am wide footed so need something that delivers on both fronts. Thanks. I have very wide and very flat feet. At the first the leathers were putting some pressure at the sides, especially where the leather ends. After a few matches, they broke in nicely and accommodate my wide feet. I wouldn't get the synthetics, they run a little wider initially but I doubt they will stretch out enough to ever be comfortable. Get the leathers and use break them in a bit before trying them out in matches. The rumor about the studs breaking is true. The two times I've ever played on AT, a stud has broken off on the toe of the cleat. It is a shame because it was a really good shoe. I just got the leather version so now I have tried both synthetic and leather and I personally like the leather much much more. I'm going to be blasphemous and say I even like the Galeo leather more than K-leather. I think its softer, more comfortable and gives a better touch. How could you say that Danny?? Only kidding, glad the Galeo leather is working out for you! Anyone else got thoughts on this? From experience it seems like the synthetic will be uncomfortable unless it fits perfectly out of the box. Get it .25 too small and your toes are going to get punished, .25 too big and you'll be shifting around. I had the same problem needing about .25 worth of extra space for my toes and while it got slightly better i still have problems. So i got the leathers and they definitely stretched for my toes. i should have known better from the start but i was curious. ok. i was planning on getting leather anyways. it just bugs me b/c i feel like i kick harder in syn than in leather. so danny, i guess ur hinting that i should get 9, seeing as u didn't say which size. looking to order them b4 next week….wish kitbag.com had 8.5 UK.. i emailed and said wth where's the half sizes, in a polite intelligent way. they got the yellow ones for $132! no half sizes tho -.- its a shame i won't have a bag to carry my adizeros in. who's idea was it to not include a bag in the box! Yeah, my advice would be to get the 9 in the leather version. You definitely don't want to get leathers that are too big and they'll also stretch and be more forgiving on your feet if they're just slightly too small. 8.5 is definitely too small. The leather is much thinner on the adiZero. hi , i need help urgently and want to ask you that i bought f50 adizero in leather and after 3 games the sole plate lost its shine and got many scratches and the upper’s stitching is slightly coming off .what can i do to prevent it all. please help urgently. If you are ok with the safety aspect then def go for them, I don't anticipate the studs causing you any problems if you are playing in goals! Hey Bryan, ive already ordered the leather adizeros this review convinced me. However how are these for durability? I really cant afford another pair. Personally, I found them to be fine durability wise, I have worn them for several weeks with no problems. Do the leather adizero's require leather food like the adipure iii's? I'm a center attacking mid, defensive mid. i love these shoes and i feel like i shoot harder when my cleat doesn't have alot of material covering my foot. i love to shoot the ball and switch the play. should i get these bryan? I found that they actually didn't need any leather food, although it wouldn't hurt to apply some. They work well for attacking midfielders, although I feel they have more benefit for players who are looking for speed. If I buy a pair of new adizero's cleats ("sprint skin" version), could I take a 44 size (uk9,5)? Do I need to take one bigger size, 10 1/2 UK or, do I believe that they will stretch? Nowdays I were the Nike Mercurial Superfly II, 10 UK and they are to tight, thats why i need to buy new shoes. If the F50 adiZero synthetic for very very tight it only makes sense to go up in size! The leather fits the same as the synthetic, and they will stretch more. But, you don't want to struggle for the first few weeks while wearing them, waiting for them to break in. Awesome site, great reviews! I recently tried on the synthetic ones in a US 9 and they were really snug and was pushing the limit in terms of room for my toe. I also tried on the US 9 1/2 and they were to big. I want to get the leather ones, but the adidas store didn't have any and was wondering in terms of size what should I get? From the other post I've read they say they run a 1/2 size bigger than the synthetics, right? i got the leather boot half a size smaller, and it now cause me blister.Furthermore, i did a stupid thing, i stepped on the heel and now it is slanted, any way to make it straight again? So i have narrowed it down to two boots, the leather adizero or the t90 laser iii. I would like to know ur thoughts on which is better for me as a forward. I've heard that the stitching in the adizeros gets dirty and it looks bad is this true? Also would the leather version absorb a lot of water making them heavy? And if i am a US size 11 in the lasers what would i be in both synthetic or leather adizeros?… sorry for all the questions Bryan. i have been trying to research the yellow leather adizeros for some time now….are there any plans of releasing the yellow leather adizeros in the U.S.? hey bryan, i cant decide whether to get these, the nike tiempo legend III, or the adidas adipure III. i play on the wing, and speed is my strength without a doubt. i want a lightweight boot, but at the same time it needs to be strong to prevent injury (this is why i prefer leather) and durable, because i hate boots that get scuffs and get scratched easily. i obviously find adizeros appealing due to how light they are, but again, are they strong and durable enough? At the same time i find the tiempo’s appealing because ive worn them before, and they lasted me ages, really comfortable, strong, and durable with the help of ‘leather food’. although they’re not the lightest, they are pretty light for a boot that has an upper complete with k-leather. i’ve never worn adipures but they’re slightly lighter than tiempos, and should be very comfortable and have good protection due to the leather. however ive heard rumours they aren’t durable, with problems such as the upper coming away from the sole at the toe. could you help me by pointing me in the right direction about which ones to get? or even perhaps recommend a different pair of boots that will suit me better? thank you for your time. bryan, say im a size 13, and i need them to fit for awhile should i get 13.5? are they half a size to big like the synthetics? Maybe try stuffing some newspaper inside to replicate the shape of your foot. I haven't heard anything about a US release of the leather yellow version, but if I do I will post it up. I always say stick with whatever works unless you are sure that something else fits better. Check out each of the reviews for each side-by-side to compare on the likes of Durability and Performance. I play on my high school team (no club) and I'm entering my senior year. I play defender (but occasionally move up to mid) I read the part about lacking protection with these cleats but is that the only downfall to a defensive player owning these? I'm currently deciding between the adizero and the nike total90 laser III's (both felt great on my foot in the store). I'm in Oregon so rain is another large factor for me between leather and synthetic. Durability is also huge for me, in that I want my moneys worth from a significant cleat investment. I'm sort of lost in the process and would appreciate any recommendations. so all I have to do is stuff newspaper inside my boots? Just curious though, how will stuffing newspaper help? Protection is an issue for defenders, particularly if you like to get stuck in. The T90 Laser III will offer more protection. Playing in a wet area, I would recommend going for synthetic over leather. If you want to straighten the heel you will want to replicate the shape of your foot, stuffing newspaper in the area is the best alternative! Thanks for the input, I decided to go with the yellow synthetic adizeros since i got a good warranty and due to that fact that my body has never been to fragile. hopefully i'll love playing in them as much as i loved trying them on. alright Bryan i'm from New York and i wanna know what to get i'm more of a striker and i shoot a lot i also have speed but shoot is most likely my main advantage so i was wondering should i get leather or synthetic?? I have worn adidas shoes my whole life dating back to when the predator accelerator. I have always worn size us 9. I bought the f50 adizero synthetic and got size 8.5 which is half a size smaller than usual due to peoples reviews. They fit perfectly because I do not like alot of space in the toe box. The have normal size feet maybe a slit wider than normal and the width is perfect and there is still a tad of space in the toe box(meaning my toe doesn't hit at all) with the 8.5's. I switch off from my adipure 1's and predator x which I have in size 9. I feel as I wear them the leather is stretching and could use a smaller size. However, I also wear the predator powerswerve and I have absolutely no room in the toe box with a size 9. My question is what size should I get the f50 adizero leather version? I had the puma v1.08 but i didnt like it because they were too tight in size 9.5 width wise but there was too much space in the toe box. Is the leather version of the f50 adizero the same length as the synthetic? I have no problem working the leather in if the width is tighter but I dont want to get a size 9 and have a ton of toe room. What do you think? hi bryan, just wondering if these boots run wide? i'm really thinking about getting these, i'm just not sure if they are the right shoes for me. I play as a playmaker in center midfield and was wondering if there could be any problems for me with these boots? I fit medium-wide and they were comfortable. Only problem would be protection, particularly if you tend to get tackled a lot. Other than that, they work great! hey bryan, i mainly play in astro turf so i wanted to know if this ones can handle, like the studs wont break and that, and if the wont make me blisters because of not being made for astro turf. im a striker/attacking midfielder. I played with these on artificial surfaces for several weeks with no problems. You just feel more contact with the ball when striking, it doesn't hurt. But a bad tackle can feel a little more dramatic because of the thin material. Hi Bryan! I play centre midfield mostly like a "regista". I go down alot to get the ball and move it forwards. The climat here is very rainy and the fields become very slippy,wet. I wonder should I go with Synthetic/leather ones for more touch and controll in wet fields? Hi Bryan, I want to ask you about wide fit of these boots. I wear right now mercurial vapor VI's and they're really comfortable despite that I have wide feet. I wanted to buy a leather version of Adizero. Do you think they'll good for me? hey i got my adizero black/sun yellow leathers and im a 10.5 in nike so i ordered the boots true to size like you said and they came out to big even with two pairs of socks on. what the hell man i followed what u said and u screwed me. I feel the Synthetic would be a better option in wet conditions. And yes the leather fit more true to size than the synthetic. I have a medium to wide fit and the leather adizero was a comfortable fit. Sounds like you have some sizing issues, sorry to hear about that. Ok thanks. But Bryan if you have to compare Vapor VI's to AdiZero's which one are wider fit? I was wondering if there's a difference in durability between the two uppers. There is, but it depends on where you wear them and the type of conditions you play in. For the most part, the synthetic version will offer a little more protection, but Leathers tend to last a little monger without ripping. I have heard a few people talk about it. I am continuing to wear the pair I have to see if it becomes an issue, but thus far no ripping. The Synthetic run a little longer than the leather version. i would order true to size with the Leather. The Synthetic offers a little more protection as the leather is a much softer material. Although it is not ideal, the FG version will give you good grip on the turf surfaces. I have wore them several times on turf. The only issue might lie with the stud problem that people seem to be encountering. Your best bet is to compare the reviews side by side to see which compliments your game and what you need best. bryan,which one did you like more, leather or synthetic. I was stuck between the synthetic and the leather, and I was wondering if the leather version absorbs a lot of water during rainy games and become heavy. I know that the synthetic version have some sort of coating to prevent that, but I wasn't sure about the leather ones. I didnt get an adequate opportunity to wear both in wet conditions. From my experience, I feel the leather will soak in water, but they dry very quickly due to how thin the material is. Hi… I'm thinking in buy the adizero leather but the color i want i just see size 7 and i use normaly an 8 in adidas (adipure and predator) but i tried an adizero synthetic in size 7 and feel nice in the feet but in your review you say that it runs true to size …. what should i do? Buy in another color ? or take the risk and buy size 7…? Only thing you can do is return them to the store or to Adidas before it fully splits (as long as they are in good condition). Sorry to hear you are having problems with them! If you tried it on and it feels comfortable (enough room at the top of the boot to wiggle your toes freely) then go for that size. I play left mid and center attacking mid and I was wondering if these are a good choice,and are these cleats good for turf. It is a concern and could pose a problem – it really depends on how much you want them! They are a great boot if you manage to get a pair that don't cause any problems. I've tried on the leather adizeros about 5 times and absolutely love them. The only reason I hesitate to buy them is because I'm one of those hard-hitting midfielders who probably could do with more protection in a cleat. I'm totally in love with these, though, so I'm thinking of indulging anyways. Do you think I'll regret it? Bryan I am a rugby player who plays on the wing, very fast, but am also looking for comfort when running but am also looking to boost my kicking game with accuracy/power whilst moving at fast pace. I am a current vapour wearer but considering a move to adizero (leather), predator x, or nike tiempo legends. what would you reccomend? What surface do you normally play on? As for me, I typically play on artificial grass, which seems to take a huge toll on lightweight boots. I have been playing in the leather Adizero's for approx 2-3 months, and after my last session I noticed that the stitching at the front of the boot (around my big toe) had come loose, causing the leather to detach. What I am essentially trying to ask you is, which of the versions do you believe are best suited for playing on artificial grass? In terms of speed the adiZero's would be a very natural option – it depends on the protection level you want. If you need more protection then the Preds are a better option. Thanks, I have also had a look at the nike maestri CTR's? and Im still torn between nike and adidas? Very cool shoes.Rating would be 7/10. I had them for my outdoor season but some of the studs fell off. Then i got nike superfly 1, black on yellow with nike red laces. The only reason why i got the 2 expensive shoes is because i play in elite level for Saltfleet. What is better for the average centre midfielder? adizero's or nike ctrs? I just got these shoes about 2 1/2 weeks ago and have played maybe 12 (2 hr.) training sessions in them, i tired to use them in a match a couple of days ago and got a couple of huge blood blisters on account of my foot sliding around a bit in the shoe. I would say the shoes fit well with a little room in the front (about 1/2 an inch because my feet are still growing). Is this too much room? I don't know if the shoes will break in better eventually or if i should try a different pair of shoes? If i continue to wear them will they eventually mold to my feet better? Very tough to say – definitely not a good sign that you blistered. While you are healing make sure to wear different boots that are more comfortable. These boots do break in nicely, and should ultimately be comfortable pending they are the right shape and size for your foot. If they continue to cause discomfort now, it might be worth holding off wearing them until you grow into them. My friend recommended synthetic over leather for the adizero, I still can't decide. choice over nike mercurial vapors? Check out the Synthetic versus Leather post to see more about each boot head to head – should help with selecting! i want to know about sizing. I have the adipure ii in US 8.5 and it is a snug fit, very little room in toe but comfy. should i order the same size in the leather version? btw do synthetic and leather feel the same in the same size? there are synthetics in local stores where i can try out, how much does the leather stretch? adipure and leather version of the adiZero fit very similar so they should also give you a snug fit. The synthetic version fit just a tad bit longer. I am between these leather adizeros, the new adipure iv, and the new ctr ii's and i was wondering from your experience which you would recommend… Also I am also a size 9US but my foot is a bit wider than normal…i know you say that your fit is also a bit wide but would you still recommend getting a 9 in the adizero rather than going a half size up? Cheers. It depends if you are looking at the Synthetic or Leather version. For Synthetic, stick with a size 9US – they have a little extra room to start and don't stretch. The leather version might be where you consider going a half size up. I stuck with a size 9 and over a week or two of wearing them they stretched perfectly to the fit and shape of my foot, but if you are worried about the fit you should try testing out a pair in store. I am thinking of getting these. Do the synthetic ones have a good touch? if so what size do you think i should get? do they fit the same as the predator X ? They fit slightly differently inside the boot (because of the type of leather used) but in both I wore a size 9US that felt true to size. The actual feel on the ball also differs for the same reason – you are going to get better protection with the Preds better more feel with the adiPures. White/black/pink leather f50 adizero's or Black/black/met gold adipure 3??? Which shoe do you think is better adipure 4 or leather adizeros? With mine, the front outside stud on the right boot fell off within the first training session (breaking in sesh.) I was using them on FG (grass field) as they are meant to be played on, and brought them home to find one of the studs missing. They're are really great boot, but I would recommend the new Black and Warning version of the adizeros, as a call to the manufacturers informed me of a new design/configuration of the studs to keep them from falling out while playing. I go the adizero leather boots and the synthetic boots as well. It was very hard to choice what boot was better, but i would have to say the synthetics because it was a little lighter but did not get any heavier. I do like the style of the leathers more but they got heavy after a couple of rain games. But the what i didn’t like about both of them is that the studs feel off…… it was weird. only negative i have and there was not much protection and being a defender you need that protection. So I purchased a pair of adizero leather cleats, haven't actually tested them out yet. But usually I apply "waterproofing and conditioner for leather" treatment to my leather cleats before anything. Under a list of "Do's" on a list that came from inside the box it states, "The boots do not require waterproofing". Do you know if this treatment will negatively effect the cleats? Bryan, I was also wondering if you knew if there was a difference between the adizero f50 and the adizero f50 2 other than the color way. 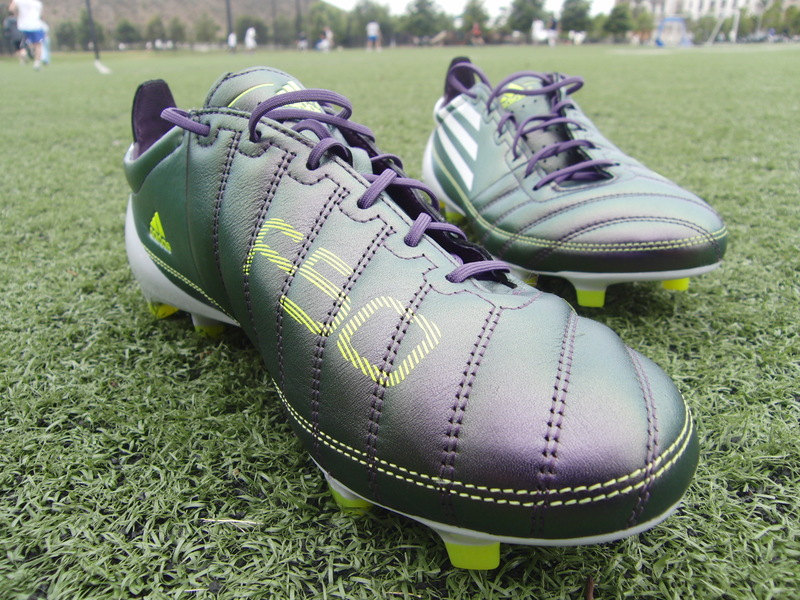 How do you think these leather adizeros compare to ctr360 1 elites in durability? i play mid/forward and play on artificial turf maybe 25% of the time. i am looking for some new boots and found these. i play left back but i am very attacking, do you think these boots will be suited to that sort of play? Just the actual boots aesthetic design. Because of the lighweight and thin properties of the materials used in boot cleats they even out in terms of durability. If you are not concerned about getting injured in tackles, then yes they are a decent option! Didn't reinforce the strength of the studs in the newer versions? So the F50 2's studs should be more reliable. Also the synthetic version of the primes look like the pattern of little raised bumps on the material is different. I don't know if this was strategic or not but I thought i read somewhere the sprintskin material was updated somehow. Also, the touch on the synthetics is probably similar to the vapors, you need to get the leathers if you want to see a big improvement there. Bryan, i have a new pair of f50 adizeros in leather. For the first "brreaking in" session, I used the Comfort insoles as recommended, then switched to the Ultralight ones for a practice my third times using the boots. That practice, I began experiencing low back pain and it has gotten bad enough that I'm writing this in bed, barely able to walk or stand for any period of time. It should be healed in a few days, or at least my chiropractor says so. Any suggestions on how to make these boots more comfortable? Because i really do love evey other aspect of them. Maybe leaving the Comfort soles in would help? Sorry to hear about your back problems! I used the comfort insole for most of the time I wore them. Lets be honest, they is minimal weight difference between the comfort and ultra light – and if it means you get to wear them as a result it is worth a shot! I am a striker and looking for new cleats. I like to shoot from free kicks. So what is better the Adizero in Black/Black/Warning or the T90 Laser Elite World Cup Edition? What do you think about adizero first and adizero second versions. Wich of these boots are better. I heard about that first version has got synthetic leather and second natural leather. Diference in cost is 10-20 dolars. Is good to buy second version or the first version of Adizeros?? 2. I was thinking of buying a pair of these boots but regarding the sizing, would you recommend I go a half a size up if I felt that the synthetic version were to short for my feet? Sorry to post late but does shoe actually have a green shine? Or is it just the grass reflecting? It looks nice. I can't find the leather pair of the Chameleon Purple/White/Electricity version for sale online. Please send me a link to a store that has them for sale because I'd like to buy the leather version rather than the synthetic.